Lilac Syrup. An unexpected summer cocktail and beverage addition. 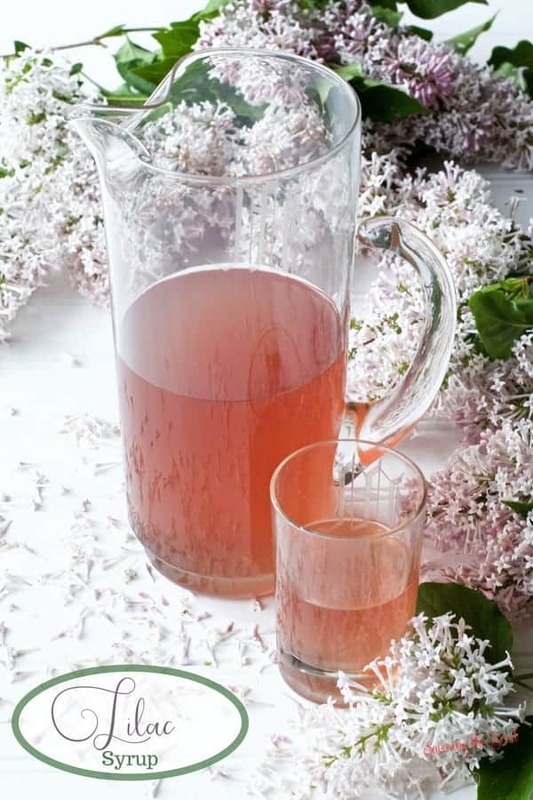 Lilac syrup is a lovely addition to your favorite summer cocktail or non alcoholic beverage. This floral simple syrup is perfect for wedding showers, baby showers or summer parties. If you are looking for another layer of lilac flavor for your beverages make a batch of lilac infused alcohol. This recipe is for vodka but feel free to switch it out for gin, or an alcohol of your choice. Making a simple syrup of lilacs, water and sugar will make your summer drinks have that little ‘something’ that no other drink will. Lilac syrup tastes just like it sounds. A syrup that tastes like the fragrance of lilacs. It is that simple! Combine the water, sugar, lilac flowers and blackberries. Bring to a boil and completely dissolve the sugar. Turn off the heat and allow to steep and cool completely. Strain the syrup, removing the flowers and the blackberries. Store in a closed container in the refrigerator for up to 10 days. The natural color of lilacs, when boiled is a pale yellow. But with the addition of a few black berries, fresh or frozen, the lovely lilac color to the syrup. If you don’t have black berries on hand, a drop or two of food coloring will work as well but I was going very all natural for this recipe. The lilac syrup is just as good if you don’t add any color. But when we eat and drink with our eyes first, I add the purple color to the syrup to call it out as lilac syrup. Lilac color in the simple syrup The natural color of lilacs, when boiled is a pale yellow. But with the addition of a few black berries, fresh or frozen, the lovely lilac color to the syrup. If you don't have black berries on hand, a drop or two of food coloring will work as well but I was going very all natural for this recipe. The lilac syrup is just as good if you don't add any color. But when we eat and drink with our eyes first, I add the purple color to the syrup to call it out as lilac syrup.